The Land Before Time Activity Center, featuring clips from the animated movie, is targeted at children in the 4-8 age group. Through interaction in nine activities, players earn Tree Stars, or tokens, that can be used to view movie scenes. Included in the list of activities is Dino Trivia, Coloring Forest, Flying Games, Make A Story, Egg Roll, Cave Concentration, Bramble Maze, Build A Dino, and Tree Star Forest. Each activity features various characters from the movie with appearances by Ducky, Littlefoot, Chomper, Spike, Petrie and Cera. Activities include forays into trivia about the movie and real dinosaurs, coloring pictures with pencil or paints, crossing a river, constructing stories based on one of three scenarios using backgrounds, items and characters and positioning items in a logical manner (Egg Roll). Other activities require matching similar pictures, negotiating a maze, constructing dinosaurs (real or imagined) using parts from a tar pit and visiting the Tree Star Forest to watch clips from the movie by trading in earned tokens. Several of the activities feature three skill levels. 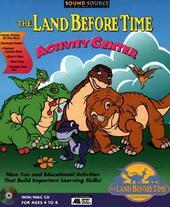 Published by Sound Source Interactive, The Land Before Time Activity Center's learning skills cover basics in puzzle solving, memory enhancement, creativity in story making, drawing and coloring and logic as players romp through the Great Valley. Other titles in the series based on the movie theme include the Animated Moviebook, Kindergarten Adventure, Math Adventure, Preschool Adventure, Toddler Time, Great Valley Racing Adventure and Return to the Great Valley titles.